After what is the longest time to ever complete a season-recap, I’ve finally crunched the numbers and determined the PJP Over/Under champion. While this post isn’t prompt, it is a lot less negative than if it was posted in mid-December. They say “time heals all wounds” but offensive coordinator changes also help. Before we get into the post, I first want to congratulate malley02 on the 2018 PJP Over/Under championship. Thanks to all who participated and we’ll see you back here in 2019 for more picks. PRESEASON EDIT: With Brandon Dawkins leaving, Michael Penix is the main guy that could split snaps with Ramsey. With the departure of Brandon Dawkins following our initial post, the smart money was probably on the over here. In fact, despite the presence of Michael Penix in the FIU and Ball State games, Ramsey had already reached the over heading into the Penn State game. Despite the promising glimpses from Penix, he didn’t drastically outperform Ramsey in any meaningful way. Penix had a slightly better success rate passing, but with the tiny sample size, it’s hard to come to any conclusion. It wasn’t as if IU’s offense was on a completely different level with Penix in the game. Having said that, I think his arm strength does open things up downfield more and he would have given IU’s offense a jolt down the stretch had he not be injured. But as Dan wrote recently, there’s a scenario in which Ramsey holds off both Penix and Jack Tuttle in 2019. In 2017, Indiana’s longest rushing touchdown by a running back in non-garbage time was 8 yards. In 2018, Indiana’s first rushing touchdown by a running back gave this one to the overs. 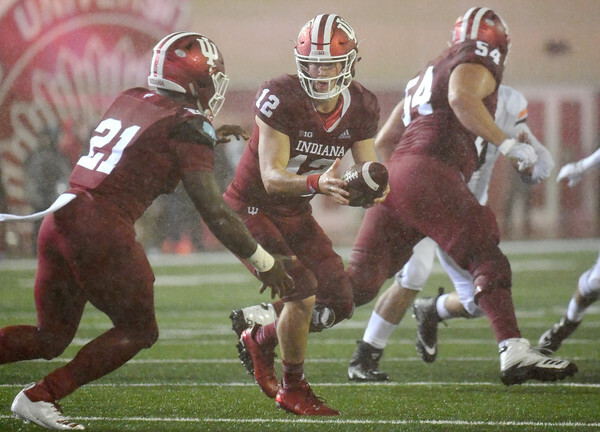 Stevie Scott went 40 yards in the rain against Virginia, demonstrating a big play ability that IU had been lacking from their backs and, frankly, one that we didn’t expect from Scott. It wouldn’t shock me if that ends up being the longest rushing TD of his Indiana career given that the criteria requires a TD. He did have runs of 42 and 45 although neither reached the end zone. Ronnie Walker added a 30 yard TD run against Penn State. With Scott, Walker, anything that Cole Gest can provide, and the addition of Sampson James, Mike Hart has a diverse and productive stable of backs in 2019. With Ramsey as the primary QB, this one was probably destined to fall under. Indiana’s outside receivers averaged 13.0 yards per catch well below the career marks of these wide outs. Nick Westbrook averaged 14.0 ypc, down from a career 17.7. Donovan Hale averaged just 12.1 ypc compared to a career 16.0. Ty Fryfogle averaged 12.9. This was a trio that, in the cases of Westbrook and Hale, had previously shown an ability to make plays either downfield or after the catch. Simply put, they were held back by the offense and quarterback. Inside receivers averaged 9.5, and tight ends averaged 10.0. IU’s running backs averaged just 5.4 yards per catch, often getting tackled shortly after catching the ball. PRESEASON EDIT: With Dawkins’ departure, who knows if Taylor will see time at CB or if he’ll see an increased time at QB. If he’s forced into action as the primary QB, this one will clearly be won by the overs. After coming into the season expected to see some time on offense in addition to his primary role as cornerback, Taylor saw a significant time on the field. However, nearly all of it happened on offense. The freshman recorded 3 defensive possessions against FIU in addition to 4 on offense. That was his only game on defense, at least in non-garbage time. His role on offense quickly expanded as a wide out mainly lining up in the backfield. He averaged just under 6 offensive possessions per game with a high of 12 against Ohio State. It would have been more but his playing time was limited down the stretch as the injury to Michael Penix forced Taylor to serve as the emergency quarterback. Headed into 2019, the staff has announced that Taylor will move back primarily to defense and returns. While his quickness and ability to change directions will be welcomed at cornerback, the Hoosiers now seem a little thin at slot receiver behind Whop Philyor. Obviously this one is a little subjective given that pressures aren’t an official statistic and were tracked by Dan based on film review. But regardless, Indiana’s 16 non-Sykes pressures aren’t a huge total. Nile Sykes did lead Indiana’s DEs in pressures with 9 followed by 7 for Gavin Everett. Allen Stallings recorded 5, James Head had 3, and Michael Ziemba added 1. It will be important for Indiana to generate more pressure in 2019 despite losing Sykes. The most likely player to take a leap is James Head, who showed promising flashes in 2018. Between Head, Stallings, and Everett, the Hoosiers have a nice mix of experience and potential. Ziemba, Jonathan King, or Lance Bryant are also possibilities for snaps. A year after recovering just 13 turnovers, ranking 111th nationally, the Hoosiers shot up the leaderboard recovering 26. This total tied for 11th nationally and tied for 7th on a per-game basis. Indiana particularly improved in interceptions with 13, up from just 5 in 2017. Eleven different players intercepted a pass, up from just 4 in 2017. Bryant Fitzgerald was the only Hoosiers with multiple interceptions and everyone but Jonathan Crawford, Isaac James, and Mike Barwick (!!!) return. I would be shocked if Indiana forced 26 turnovers in 2019 (the oblong ball can take funny bounces), but I would expect them to finish above average. After the graduation of Griffin Oakes, Indiana went into the 2018 season with a question mark at kicker. Both who would be the primary kicker as well as how well would they perform. Logan Justus both won the job and performed well, making 15 of 18 field goal attempts. Indiana has had some down years at kicker but overall it has been one of the most consistently solid positions for IU in the last decade. With Justus returning for his senior season, he’ll maintain the starting role in 2019 before likely turning it over to Charles Campbell in 2020. Vegas had the line at 5 and Bill Connelly of Football Study Hall projected IU for 5.5 wins. The Hoosiers were on pace for a bowl game after a 4-1 start but, like so many seasons, IU failed to pull off an upset and dropped a winnable game at Minnesota. Looking ahead to the 2019 season, it’s likely both Vegas and Connelly will again have Indiana in the 5-6 win range. The hope, with a new offensive coordinator and a promising group of defensive talent, the Hoosiers can actually exceed outside expectations. Thanks again for everyone who participated! Click here for the final standings.